I'd like to apologise for my radio silence. I've been notable by my absence here. There are couple of very important reasons for this. First, I've sort of been organising and taking part in Pedal on Parliament 2! It was bigger, better and louder (more on that later) than last year. Amazing! Personally the most amazing part for me this year was that my family were there. My kids were pretty much the inspiration for Pedal on Parliament in the first place so it was right that they should be there. They thoroughly enjoyed it and now want to cycle more. Job done.....well partly done...as we are still a LONG way from safe roads, but inspiring children is all part of our job. I have also been very, VERY busy at work. No, I do not write this blog during work time! Unfortunately work has been severely eating into my personal time over the last few weeks. A deadline had to be met and the onus was on me to meet it. There were a few 14 hour working days in there and Sunday was my only reprieve from the onslaught of work (that's why I looked stressed!) but it is done. Until next time. But what of this anger that I mention in the blog title? The fact is, there is a lot of it about at the moment. I'm sure most are aware now of the Twitter incident where a young girl boasted about knocking a cyclist off. There is anger there. There was also anger at Pedal on Parliament 2. Funnily enough, the crowd was having none of it and made it quite clear to Paul and the government that we are sick and tired of being told that the government takes cycling seriously, when it is plain to see that it doesn't give one hoot about it. Feed the cyclists a few crumbs, that'll keep them quiet. Paul found out that it won't. It's time for the government to stop being condescending. We aren't daft. Telling us that you are doing great things when you aren't just doesn't fly. You are doing hee haw. That's what I'll be telling the Transport Minister Keith Brown next week when I meet him. There is no doubt that the government isn't walking the walk when it comes to spending on cycling, but that is only part of the story. What are they actually spending that roughly 1% of the transport budget that they do spend on cycling on? The government are giving Cycling Scotland money to provide training for cyclists on how to cycle assertively on the roads to keep themselves safe. It's called Essential Cycling Skills pilot. Seriously!? SERIOUSLY!?!? Let me spell out the governments thinking. Unacceptable. Totally and completely unnaceptable. I came across a my own personal example of this line of thinking just the other day. Look at the following picture. It's a helmet camera picture from a very busy road on my commute. A dual carriageway (Crow Road in Jordanhill for those in the know). I can honestly say in my near 8 years of cycling this road I have never, NEVER, seen any children cycling on this road. I've seen a few on the footpath, but never a child on the road, anywhere from about 2 miles back to about a mile ahead. Not one. Hee haw. Yet, look at the top left of the picture. There you'll see a picture of a child holding out his arms asking for a bit of 'cycle space'. Brilliant. Just brilliant. 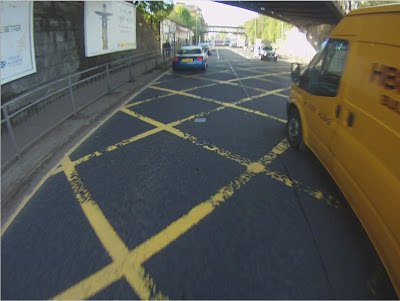 So rather than make this road safe (and there is plenty of space to do it) for children, and anyone else for that matter to cycle on, lets just ask drivers, who if they are incredibly, incredibly lucky, might just come across a child cycling on that road, to give just a wee bit of space. I've certainly nothing against Cycling Scotland, they are in a difficult position having the government as their paymasters. We certainly will need soft measures alongside the the infrastructure measures, but on their own they are a complete and utter waste of tax payers money. So yes, I am angry. Very angry. The question is, when, if ever, will we get even. Now if Paul Wheelhouse had said "I could read you a list of all the initiatives but clearly you know much of what I would be likely to say, and instead I shall take the message back from you that you want action" he might just have got a cheer from the crowd. Clearly not able to either think on his feet or say anything to upset his boss. Condescending - an appropriate word. Maybe next year we'll get a better ministerial speech. Surely they should look at it as which is the most cost effective solution? Why spend money on a training program for a limited number of people who will need to sign up for it and only potentially last a week or so instead of spending it on proper infrastructure that will benefit EVERYONE forever? Hell you could even argue that proper infrastructure will eliminate entirely the need for sodding training!!!! I wonder how many cycle training programmes the Dutch run? Well, in dutch primary schools there's a "traffic education" course, which teaches kids how to behave in traffic and what the basic traffic rules are. I'm not sure if it's compulsory though, and it doesn't teach them how to actually ride a bicycle (that's almost built into our genes anyway ;-) ). See http://www.aviewfromthecyclepath.com/2010/04/school-cycle-training.html for info on Dutch cycle training. Further note the point that the cash comes out of the basic education budget. But as to effectiveness, re-branding bits of Bikeability "Essential skills" is (as suggested in the Blog) window dressing as far as a big slice of potential cyclists are concerned. Bikeability (or ES, or whatever you want to call it) is limited in its usefulness to the sort of people who don't mind mixing it with relatively serious traffic - enthusiasts, in other words. If Joe Punter won't cycle because he's afraid of the roads then coming up with a course he won't do because it doesn't address the basic problem of him being afraid of the roads is rather wide of the point. There's nothing /wrong/ with that sort of course for what it is, but (very much like Bikeability) it isn't going to get lots of people cycling. It'll be limited to giving a better start to people who have already decided to be cyclists. Pete (CS accredited Cycle Trainer Plus so I should have a pretty good idea of what training can achieve). I live near that sign on Crow Road. There's a fair amount of pavement cycling (by grown ups) because the road to Anniesland is incredibly horrible. My wife sent an email to our councillors a few years ago about the lack of cycling provision and received an official reply to the effect that the council didn't think it necessary. Into the Darkness? Let's Shine a light. What Chance Have We Got?